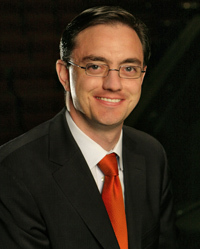 The start of Timothy O’Leary’s tenure as general director of Opera Theater of Saint Louis in the fall of 2008 coincided with the arrival of James Robinson as artistic director. Working with the company’s longtime Music Director Stephen Lord, they’ve “focused not on revolution but evolution and building on the strong traditions of OT,” as O’Leary puts it with almost giddy understatement. Since assuming his post, he has helped widen the field’s repertoire with projects such as the New Works, Bold Voices series, which comprises the world premieres of three operas, and he’s overseen an endowment that has grown from $16.5 million to more than $25 million. O’Leary, 38, is quick to credit others, including predecessors Charles MacKay and Richard Gaddes, as he discusses the company’s new initiatives. They include the Engagement and Inclusion Task Force, which builds partnerships in the community tied to the aforementioned new works. Task Force activities that surrounded last summer’s premiere of Champion, for example, not only helped familiarize potential audiences with the inaugural entry in the New Works, Bold Voices series, they also provoked discussion and exchange across demographic lines. The first opera by jazz composer Terence Blanchard and Pulitzer Prize-winning playwright Michael Christofer, the piece focused on the life of African-American boxer Emile Griffith, whose homosexuality was, at the height of his career in the 1960s, a source of great consternation, both to him and the public.